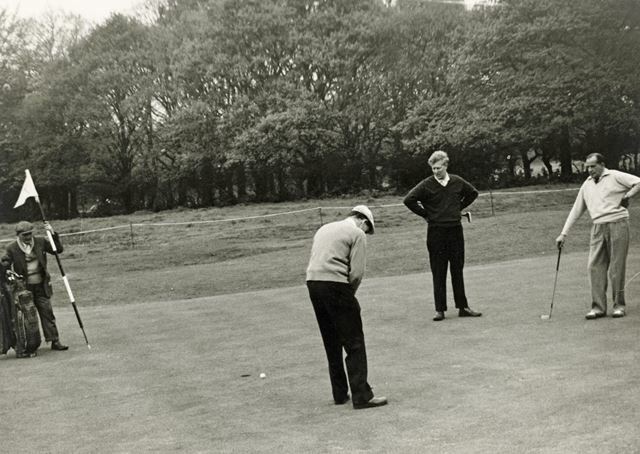 A pro-am competition on Wollaton Golf Course during the early 1960s. The blond man in the centre right was the then Ryder Cup Captain, Bernard Hunt. The course itself, which has hosted many important championships, the latest being one of the popular Seniors Tour events, was set out in 1927 and was designed by Tom Williamson. It has been sensibly upgraded over the years to provide a fair test of ability for both the beginner and the experienced golfer alike, measuring 6,445 yards with a par and standard scratch of 71.